Thursday 27th September will see the ground breaking ceremony for Iliad’s new high specification student accommodation development in the Ropewalks area of Liverpool. This project not only builds upon Iliad’s long pedigree of urban regeneration but also their commitment to supporting the development of young people in the local community. Louis Crosbie has been awarded a specially created 2 year apprenticeship position in partnership with Iliad and VINCI Construction UK. Louis Crosbie, 18 years old from Speke will undertake a 2 year apprenticeship programme through ConstructionSkills and will achieve a BTEC National diploma in Construction and the Build Environment, plus an NVQ level 3 in Construction Site Supervision at St Helens College. The two year course consists of 4 days practical training on-site and 1 day study in college. Louis will be expected to create a portfolio of evidence demonstrating different skills and tasks he completes. His development and progress will be supported by his VINCI Construction UK mentor and ConstructionSkills advisor. “The Ground Breaking Ceremony is an important event, signifying a key milestone in the overall project at East Village. In addition to this we are also celebrating Louis Crosbie on being awarded the apprenticeship placement which was specifically requested by Iliad for this project. VINCI Construction UK has always encouraged apprenticeships onsite which provides local people with valuable skills to not only enhance their future prospects but also to promote employment opportunities in local communities”. The St Michael’s student development will consist of 261 student rooms, comprising of 225 flats of 4, 5 & 6 en-suite rooms, clustered around a spacious kitchen and lounge area, with a further 36 studio rooms. Amenities include an on-site laundry, a games and common room for the exclusive use of residents with a 24 hour manned reception. 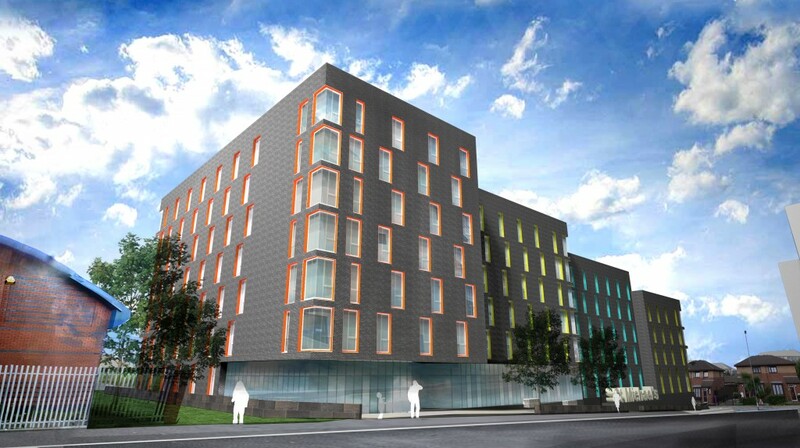 VINCI Construction UK is the appointed contractor and will construct the new multi-storey student accommodation project. The development has been forward let to Cosmopolitan Student Homes and will be ready in time for the September 2013 intake of students. The entire project has a gross development value of £20m and will be built to BREEAM Very Good specification level. This project will take the standard of student accommodation in Liverpool to the next level, with all rooms being 25% larger than competing rooms in the city. The building has been designed by award winning architect Tim Groom of Formroom Architects, with Iliad Group overseeing the financing, construction and delivery of the development. Formroom Architects have designed a contemporary, spacious and innovative student accommodation block, which fits Liverpool’s on-going regeneration. The new build will provide a mixed-use city living environment located in the south east centre of the city.